The current government coalition of national unity remains shaky and prone to tensions. Consisting of both secular and (moderate) Islamist parties it lacks ideological cohesion, which hinders effective decision making. The main secular alliance in parliament, Nidaa Tounes, is affected by continuing tensions about leadership and policy direction. That said, efforts to reinstate democracy at the local level have made progress, as parliament has recently passed a law that paves the way for the first municipal elections since the revolution of 2010/2011. The internal security situation is still tense and the risk of additional terrorist attacks after several assaults in 2015 and 2016 remains high. It is estimated that some 3,000 Tunisians have fought or are still fighting for IS in Syria and Libya, and many of them returned home, posing a high security risk. Countering this threat while maintaining the democratic freedoms secured after the revolution is a major challenge. Additionally, the government needs to address the major social and economic problems (high unemployment above 15%, poor living standards and low economic growth) in order to prevent social unrest. 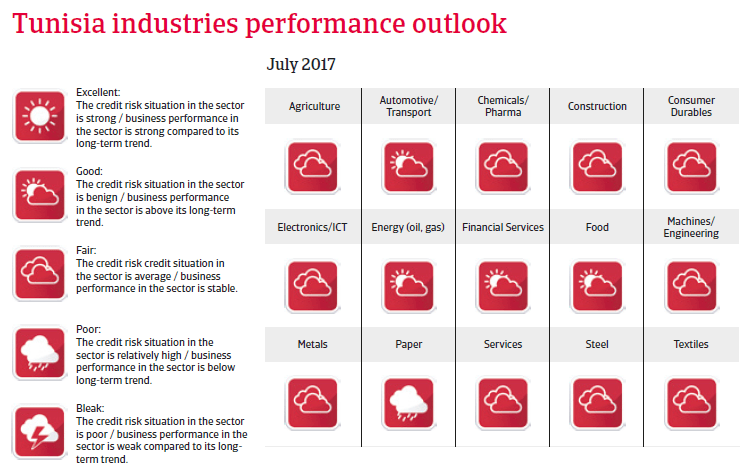 In 2017 a moderate 1.5% GDP increase is expected as manufacturing and the tourism sector return to growth, investor confidence has improved (following a successful international investor conference end of 2016) and crucial private-sector legislation in the areas of banking and investment has been adopted. 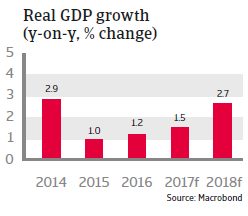 However, this rebound remains heavily dependent on the security situation, as any further deterioration could again severely hurt domestic demand and tourism. More structural reforms are needed to accelerate economic growth and to reduce the high unemployment rate. Tackling bureaucracy, reducing corruption, reforming the tax and subsidy systems are necessary to improve the economic conditions. Despite a new key banking law the financial sector remains weak and the level of non-performing loans high. In May 2016 the IMF approved a four-year Extended Fund Facility (EFF) arrangement worth USD 2.9 billion, of which the first review was finally completed in June 2017 after some delay due to the slow reform progress (in light of the tense social and security context). 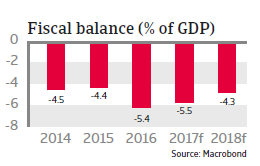 The budget deficit was large in 2016 (5.4% of GDP) due to increased social and security spending, but is expected to decrease gradually in 2017 and 2018, guided by the IMF programme. 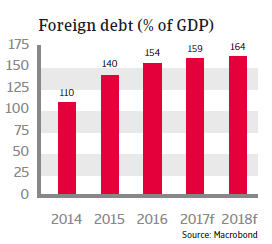 Public debt increased to more than 62% of GDP in 2016, and the large foreign currency denominated share of about 65% makes it vulnerable to exchange rate fluctuations. Reforming inefficient public institutions and containing the enormous public wage bill (which amounts to 70% of primary current spending) are key fiscal reform priorities. 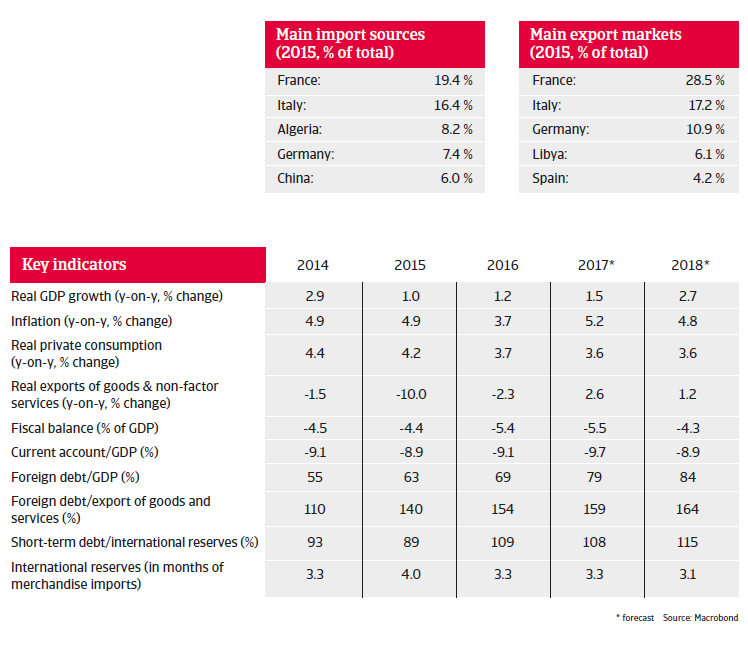 Tunisia´s external position remains vulnerable, with high annual current account deficits due to less exports, lower remittances (many Tunisians worked in Libya) and decreased tourism revenues. In order to finance the twin deficits, external borrowing has increased, resulting in high foreign debt (69% of GDP in 2016). Foreign reserves are not covering Tunisia´s high external financing requirement, and the country will remain dependent on multilateral and bilateral support.